This flavor was my favorite pack of noodles growing up so I was very excited to revisit it and see if my opinion had changed. These noodles come from Taiwan. This is notable because Taiwan is famous for their massively popular style of Beef Noodle Soup. 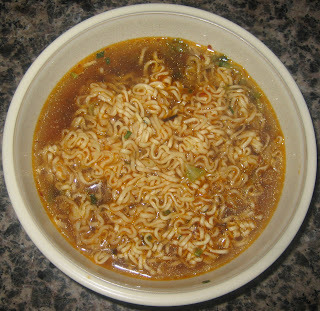 Taiwanese instant noodles are almost always recognizable from the fact that they are slightly thinner than their Korean and Japanese counterparts. To avoid creating a thin tasteless product (like the American Cup Noodle and Maruchan noodles), the Taiwanese instant noodle manufacturers tend to fry their noodles longer to give more of a nutty flavor. 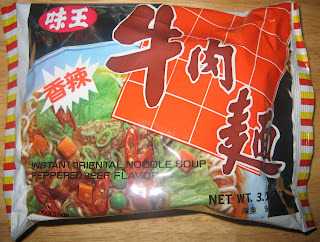 The result is a delicious flavorful noodle that still tastes light and is able to absorb much of the broth flavor. The broth in these noodles is absolutely fantastic. The beef and pepper flavors are definitely there, but there are still a lot more indescribable hints of flavor that really make the broth seem like something ordered from a restaurant. One of the flavor packets tends to clump into little black bursts of peppery flavor. Sounds a little strange, but these burst clumps are amazingly good. There is also a lot of dehydrated cabbage in this pack that plumps up nicely and adds a nice sweet contrast to the broth. I can't say enough nice things about these noodles and highly recommend them. I absolutely agree, these noodles are hands down my favorite. I love them so much. Tht flavor of this product is really good, so I have been eating it since I live alone in my new apartment, so I think that it is great.! !